One of the advantages of preserving is its investment-like quality. Each jar on the shelf represents a dinner, project, or dessert already begun. 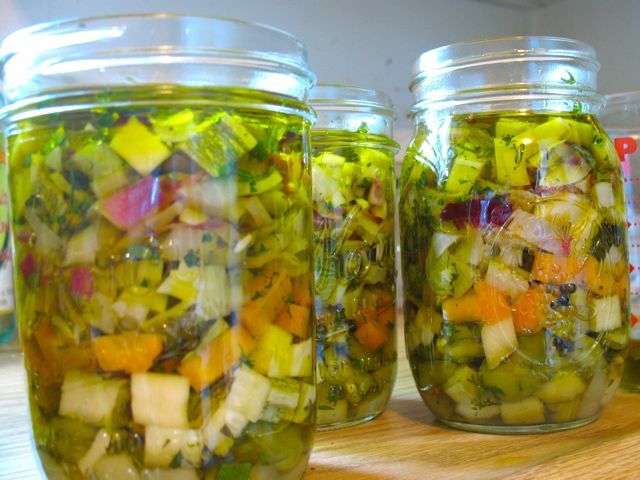 For this reason, the quaint-sounding Vegetable Medley in Preserving Food Without Freezing or Canning, by the gardeners and farmers of Terre Vivante, caught my eye. In the recipe, a mixture of vegetables at the height of summer freshness are diced, lightly pickled in wine vinegar, spooned into a jar with spices and herbs, and covered with extra-virgin olive oil. Both the oil and the vinegar do preserving duty in a marinated mixture like this — the oil by keeping air away from the food, and the vinegar by creating an acidic environment hostile to spoilage. 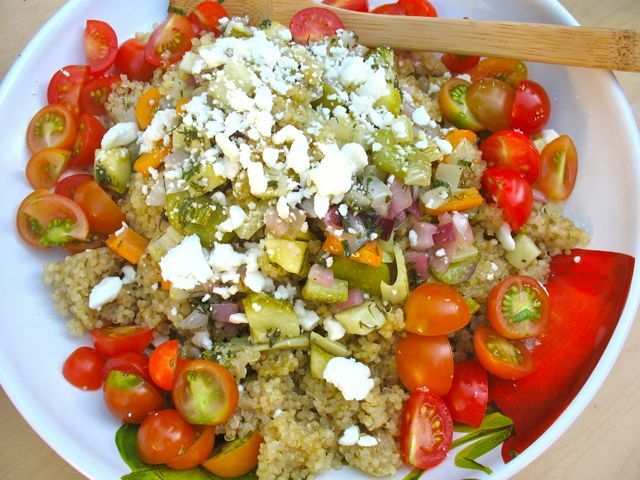 Vegetable Medley’s creator noted that the vegetables were good in couscous and grain salads. Bingo, I thought. I could see how easy it would be to stir some into just-cooked quinoa, wheat berries, or small firm lentils with a sprinkle of fresh white cheese. With the vegetables’ light pickle and the rich green oil that clung to them, I could add dimension to these dishes with little effort. This vision happened to coincide with a cornucopia of crisp vegetables sitting in my fridge, along with some dill and basil. But what about all the oil, enough to cover the vegetables by a half-inch? Preserving in oil is less popular than other preserving methods. The oil is generally considered a by-product and, worse, a caloric, messy nuisance. I didn’t see it that way. I would keep the oil in the refrigerator after I drained and used the vegetables. It was extra-virgin olive oil, after all, and it would carry the scent of the herbs and spices layered into the preserve. I could use it to dress salads and roasted peppers. I could bake chalky goat cheese with a drizzle of it and eat it with bread. If you like a nice green olive oil, it's not difficult to find ways to use it. I did stop and wonder at the instructions, though, which said to store the jars at 50 to 59 degrees for at least one to two months (and up to one year) before consuming. Without canning. I don’t doubt that generations have had success with this traditional method of preservation, but I do doubt my ability to recreate it safely. I do not possess a cool, dark cellar. And I know about botulism. Oil keeps air away from food, and slows the growth of spoiling agents. But Clostridium botulinum, the bacterium that causes botulism, becomes active in warm, anaerobic environments. Bone also admits, however — with a wink — that she would never refuse marinated artichokes that have been bathed in vinegar and buried in olive oil by a dear relative who has made it to the age of 90 even though she keeps the artichokes at room temperature. I will make Bone’s marinated red peppers soon, when the local sweet and hot peppers come on strong at the market. Bone water-bath cans hers, and sets a correct pH by acidifying with bottled lemon juice. In the meantime, Vegetable Medley has taken me through a few backyard dinners. The author was right — the medley is good mixed into some quinoa, especially quinoa that will sit under grilled meats and absorb their juices. The vegetables' pickle cuts through the meats’ smoke. The medley is also good in a warm lentil salad with nuggets of chèvre. My medley of fennel, zucchini, carrots, cucumber, and summer onions sits in the refrigerator. I put excess oil drained from the vegetables back over any that remain. I am happy to report that, after three weeks, there is no sign of food spoilage. As the cook, however, I am a little spoiled by having this condiment at the ready. p(bio). Kelly Myers is a chef instructor at the Art Institute of Portland.